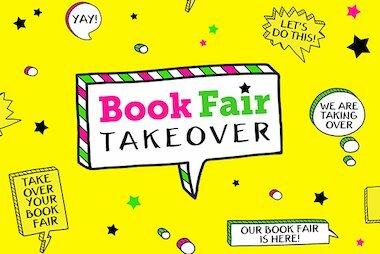 Book Fair Takeover allows your pupils to help plan, promote and run your Book Fair. 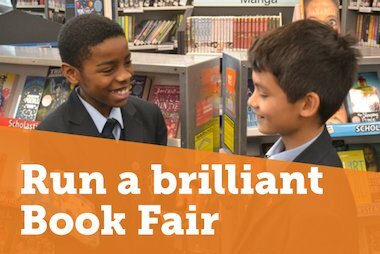 Teaching them about the world of work in a safe school environment, Book Fair Takeover offers cross-curricular learning opportunities and can help pupils improve their communication skills and grow in confidence. Book Fair Takeover Ambassadors, BAFTA Award-winning children’s television presenters and authors, Sam & Mark share their top tips for a successful Book Fair and why they think Book Fair Takeover is such a brilliant project for schools. Why is Book Fair Takeover a great project to run in school? Sam: I was never good at reading when I was at school and I’m still not confident at reading out loud now. Book Fair Takeover is great as it helps kids love books and get reading early. Mark: It’s great to see kids work together for a common goal and even better when it involves situations they may encounter in later life. Would you have taken part in Book Fair Takeover at school? Mark: I would have absolutely liked to be part of Book Fair Takeover. It’s character building and would be a lot of fun. Sam: Yes!! It would have been exciting to take part in Book Fair Takeover. What job would you choose to do at the Book Fair? Mark: I would like to think I’m a people person, so customer service would be good for me I think. Sam: I think I’d quite like advertising actually. I’d like the challenge of trying to find fun way of making people aware of the Book Fair. Who would be best at planning a Book Fair? Who would be the boss? Sam: I’m a bit of a control freak so I think Mark would agree that I would be the best at planning. I like to know what’s happening. Mark: Sam would definitely be the boss – he likes to know what’s going on. I’m a little bit more laid back. One of the reasons we get on so well is that we even each other out. Imagine you’ve set up a fancy dress competition to promote the Book Fair. Who do you go as? Sam: I’ve always wanted to wear a really professional looking Batman suit. Mark: I would go as Sam because people get us confused anyway so I would try to blow their mind. Also I can do his silly accent well. How would you tell everyone at school that the Book Fair has arrived? Sam: I’d maybe write and film some funny sketches to put on social media. Mark: I’d just use a really big megaphone. You’ve got 30 seconds to decorate the Book Fair, how do you make it look amazing? Sam: Fairy lights always make things look amazing. How would you handle an unsatisfied customer while you were running your Book Fair? Mark: I would get Sam to deal with them. Sam: I’d just try my best to make sure they leave happy. 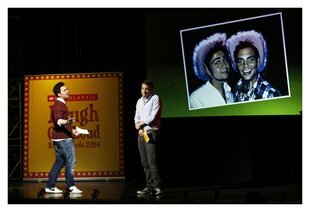 What is the secret to the success of Sam & Mark? Sam: I don’t think there is any secret. We just really enjoy what we do and try to make sure whoever we are working enjoy themselves too. Mark: We love what we do and we work really hard at it. Plus we get on really well which helps. What’s your advice for working as a team? Mark: Make sure you get on first, that’s the most important thing. Be patient with each other and try and make each other laugh. Sam: I think honesty is important. Mark and I will always say if we don’t think an idea one of us has is good and the other one knows that it’s not meant in an offensive way. We both just want to create the best work we can. Sam: It’s a very funny and silly superhero book. We really had fun coming up with this character. Mark: The first one is an origin story where you get to know Ricky and why this newfound power is difficult and brilliant at the same time. The second one involves a lot of surprises and was so much to write. Mark: Winning two BAFTAs for best children’s presenters, definitely. Sam: When we won our first BAFTA for presenting, it was amazing. We love our job and have done it for a long time, so to be recognised for that with such a prestigious award was an awesome feeling.